▶  Brokers with Virtus Commercial recently completed a multimillion-dollar franchise restaurant deal. Chris Emanuel represented seller Jones McD Pad LLC in its $2.3 million sale of 54,450 square feet of land at 108 N. Jones Blvd. Emanuel also represented the buyer, John Gregor. 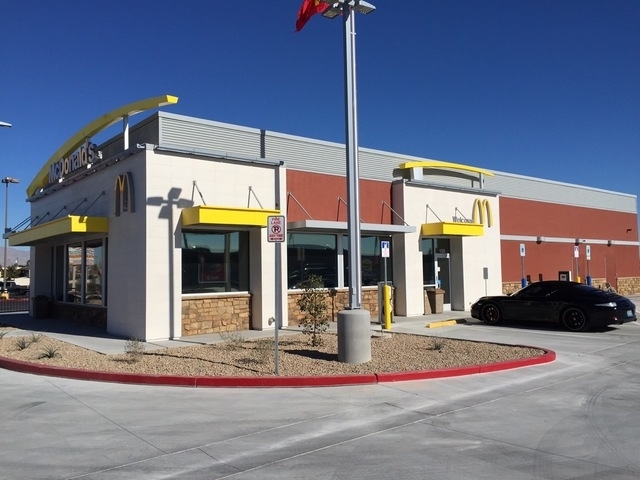 McDonald’s leases the land and has a restaurant on the site. ▶  M&D Automoto LLC has leased 1.03 acres of land at 5575 S. Polaris Ave. in Las Vegas. The transaction amount was $166,059. Dean Willmore of Colliers International represented both the lessee and the lessor, Four Way Associates LLC. M&D Automoto LLC also subleased approximately 1,900 square foot office space in Suite E the same address. That transaction is valued at $34,799. Willmore represented both the lessee and the lessor, Breslin Builders. ▶  Southwestern Construction Co. leased 2,827 square feet of industrial property at 4210 N. Lamb Blvd., Unit 135, in Las Vegas. The transaction amount was $33,914. Dean Willmore of Colliers International represented both the lessee and the lessor, 4240 Lamb Holdings LLC. ▶  Europa Sports Products Inc. leased the 46,080-square-foot industrial property at 3051 Marion Drive in Las Vegas. Dan Doherty, Susan Borst, Chris Lane and Jerry Doty of Colliers International represented the lessor, Prologis. ▶  Truck Pro LLC leased the 10,476-square-foot industrial property at 4502 Mitchell St. in North Las Vegas. Dan Doherty, Susan Borst, Chris Lane and Jerry Doty of Colliers International represented the lessor, BRE/PAC Nevada LLC. ▶  Wausau Coated Products Inc. leased the 28,800-square-foot industrial property at 4030 Industrial Center Drive in North Las Vegas. Dan Doherty, Susan Borst, Chris Lane and Jerry Doty of Colliers International represented the lessee. ▶  CCM Services leased the 985-square-foot office property at 3005 W. Horizon Ridge Parkway, Suite 240 in Henderson. The transaction value was $49,289. Jason Lesley and Bridget Richards of Colliers International represented the lessor, Horizon MOB 3005 LLC. ▶  Screens of Mass Construction leased the 9,760-square-foot industrial property at 4415 McGuire St. in North Las Vegas. Dan Doherty, Susan Borst, Chris Lane and Jerry Doty of Colliers International represented the lessor, BREPAC Nevada LLC. ▶  Advanstar Communications Inc. leased the 13,520-square-foot industrial property at 4320 Lamb Blvd. in Las Vegas. Dan Doherty, Susan Borst, Chris Lane and Jerry Doty of Colliers International represented the lessor, Roberts Ranch Venture LP. ▶  EMS Toxicology leased the 5,040-square-foot industrial property at 6171 McLeod Drive in Las Vegas. Dan Doherty, Susan Borst, Chris Lane and Jerry Doty of Colliers International represented the lessor, BKM Patrick 102 LLC. ▶  Pacific Parts Warehouse Inc. leased the 8,642-square-foot industrial property at 6295 E. Patrick Lane, Suite 900. Spencer Pinter, Dan Doherty, Susan Borst, Chris Lane and Jerry Doty of Colliers International represented the lessor, KTR LV IV LLC.